One of my favorite things about Madrid is the tapas scene. Another is its central location, which makes the Spanish capital a great home base for taking daytrips other cities like Córdoba. In less than 2 hours on the AVE high-speed train, we had arrived and it was love at first sight. Córdoba is like an onion with many layers of history, the deeper you dig, the more you will uncover in this fascinating city. At first glance, it’s a playground of palm trees, mosques and whitewashed buildings, all enclosed within the remains of the old defensive walls. Yet at one point Córdoba was one of the largest and most advanced cities in the world, serving as a great cultural, political, financial and economic center. It’s no wonder that the entire historic center – a fusion of Roman, Moorish and Spanish influence – is a UNESCO World Heritage Site. So with a (too short) 4-hour stopover before continuing onto Sevilla, we hit the ground running and were not disappointed. Leaving the train station, we walked down Avenida de América and turned into the gardens that run along Paseo de la Victoria. Now surrounded by palm trees, orange trees and fountains with ducks, it felt as if we had journeyed further away from Madrid than we actually did. After a leisurely stroll that loosely traced the outline of the green, we turned off and walked along the edge of the city’s old Roman Walls, which date back to 206 BC. The stone walls provided much-appreciated shade from the heat of the morning sun so we continued along the stone path below, dotted with greenery and a stream of flowing water, until we reached our first destination, the Alcázar of Córdoba. Arabic for “palace” the Alcázar began as fortress in medieval times, expanding over the years to a larger compound with extensive baths, gardens and one of the largest libraries in the West. It also served as the primary residence of King Ferdinand and Queen Isabella during the height of Córdoba, and was the site where the monarchs met Christopher Columbus before his first voyage to the Americas. A statue memorializing this meeting is the centerpiece of the Alcázar’s beautiful gardens, while the interior of the palace offers mosaics, ramparts and a tower with a great view of the city. There’s also a free app to help guide you through the complex. Our next stop was the Mosque-Cathedral of Córdoba (or the Mezquita for short), a place that I have wanted to see in person since my architecture history classes in college. Essentially you have a 6th century Islamic mosque (built on the site of a Christian temple dating back to the Visigoths), which was turned into a Catholic church in 1236 after the Spanish reconquista of Córdoba. Talk about layers of history. As we rounded the beautifully decorated stone exterior, I knew we were in for a treat. Entering through the orange tree courtyard, take note of the simple yet sophisticated irrigation system that provides drainage while delivering water to the trees. Buy your ticket at the back of the courtyard (cash only), and then prepare to be amazed as you walk through the forest of 800+ columns connected by more than 400 candy cane-striped arches. 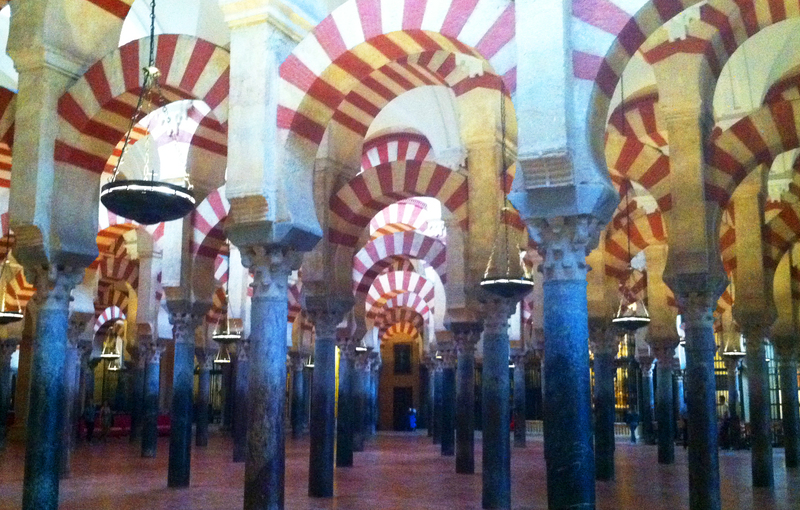 The Mezquita was constructed in 4 phases between 785 and 987, enlarging and enriching the interior space each time. You’ll notice that the red and white arches originally made from stone are actually painted in later additions to save on cost. Facing the mihrab, notice too that each floor tile is about the size of a prayer rug, accommodating more than 20,000 worshipers in the prayer hall. 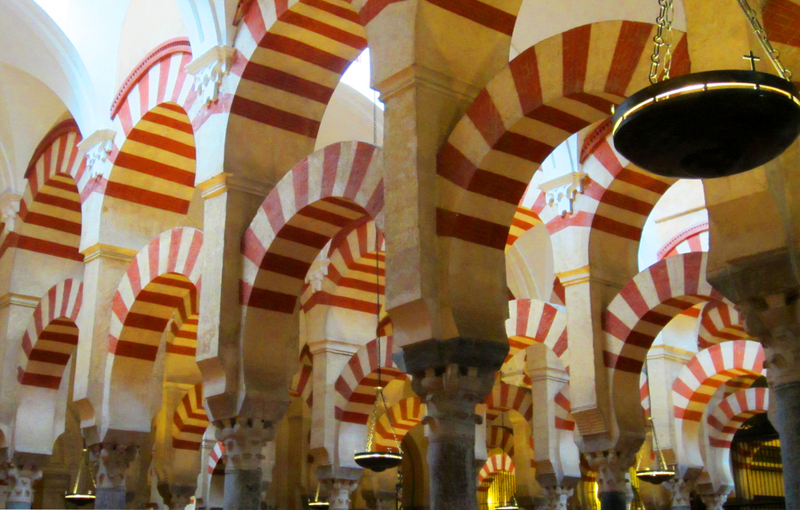 When the Christians came in, rather than tearing down the Mezquita they built their church right in the middle of the mosque. Like a jewel box nestled in its center, the ornate cathedral follows a traditional Latin cross design and utilized the building’s original skylights to deliver light to the altar and rich mahogany choir. 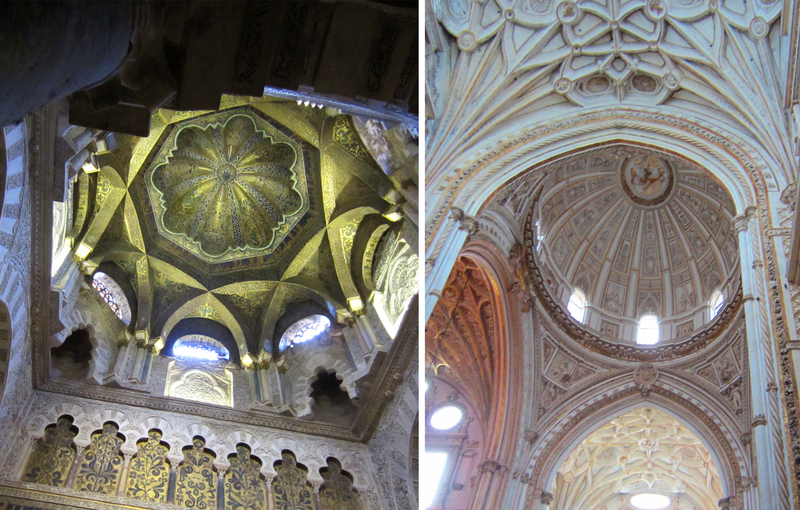 I’m still a little bit in awe of the Mezquita – as a whole the site is nothing short of an architectural wonder. 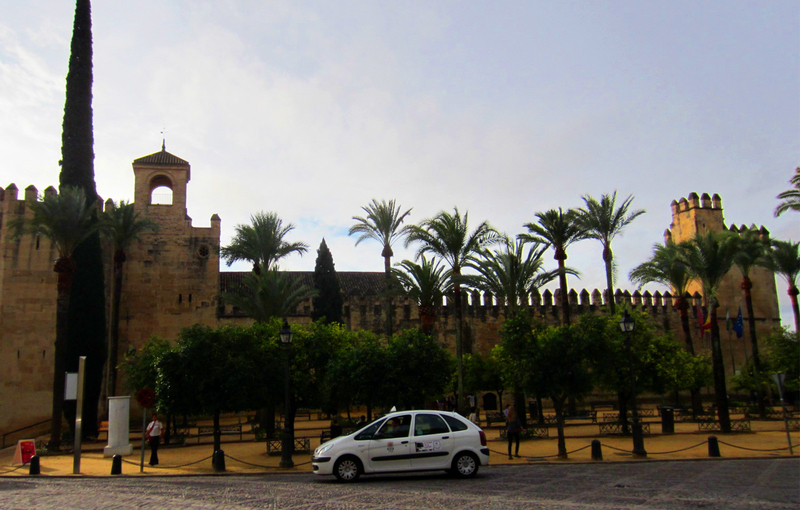 After exiting the Mezquita we walked around to the back side to reach the Roman Bridge, avoiding the gypsy women giving out herb branches “for good luck” (don’t accept one or else they’ll expect money) and the row of horse drawn carriage drivers looking for their next fare. 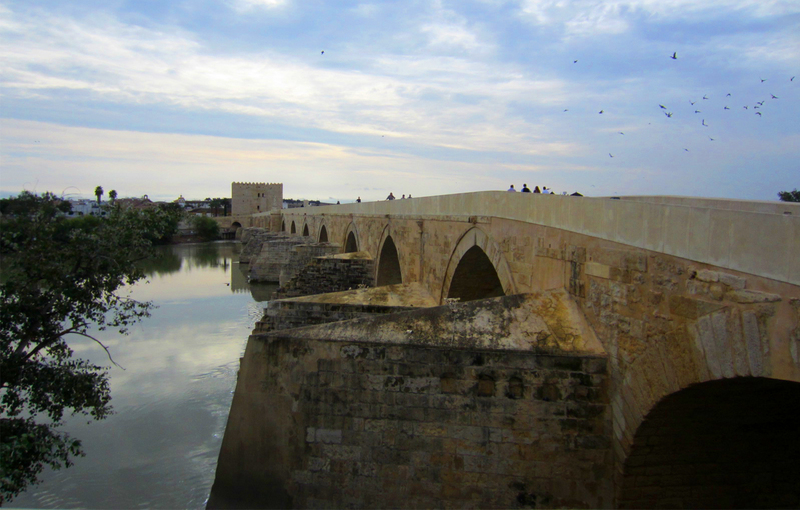 As its name implies, the bridge was constructed in the 1st century BC during the Roman rule of Córdoba, and has been restored several times throughout the years. Today’s bridge is made up of 16 arches that span 810 feet across the Guadalquivir River, connecting the Puerta del Puente (meaning “gate of the bridge”) on the north side with the Torre de la Calahorra on south side. The tower was originally built for defensive purposes, and later became a prison, then a girls school and now houses a museum. The pedestrian bridge was surprisingly not crowded, which made for a nice walk across and even better view of the Mezquita and city from the opposite side. 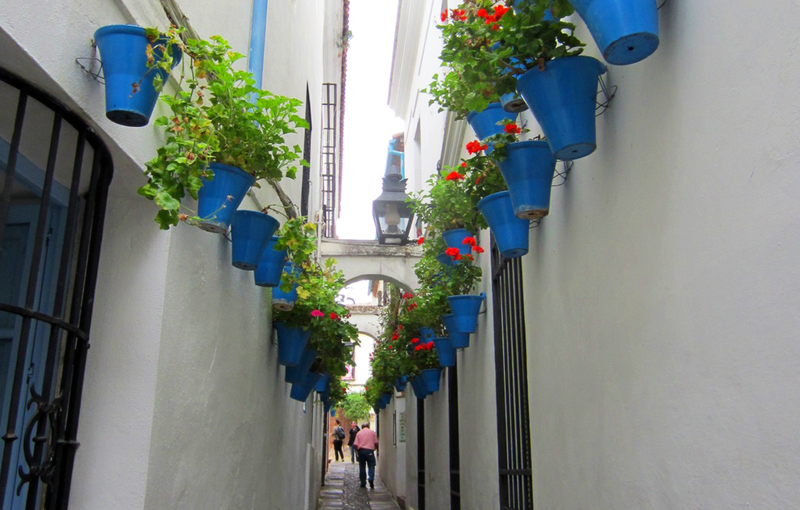 We spent the rest of our time in Córdoba wandering through the narrow, winding streets of the city’s Jewish Quarter, with its distinctive whitewashing buildings, decorative patios and adorable shops. One of my favorite places was the family-owned Meryan leather workshop at number 2 on Calleja de las Flores, a street that’s adorned with beautiful red flowers in bright blue pots. Further up at number 8 on Calle Ángel de Saavedra is De Colores (closed), a shop specializing in authentic fans, shawls, combs, jewelry and other flamenco costume items. I bought a few gifts here, including Andalucían silver earrings and some fans, which are hand-painted on premise. Even though we didn’t share the same language, the patient shopkeeper helped me open countless fans so that I could find the perfect ones to take home. Continuing on up through Plaza de Las Tendillas in the more modern part of the city, we capped off the day with a quick coffee on our way back to the train station. We were alone in the bar, sans one elderly man sipping his café solo in the corner, and even though it was hot outside the breeze from the ceiling fan above made it seem like the appropriate thing for us to order too. Taking our seats on the train, I was still in awe of our whirlwind morning in Córdoba, dreaming of when we could return.